National Relief Charities (NRC) has a strong network of over 1,000 partners who live and work in the communities we serve. They know the people and the needs on the reservations in our service area. Without these Program Partners, none of our work would be possible. We are grateful that these partners volunteer to work with NRC and take the lead as catalysts for change within their communities. National Relief Charities (NRC) also relies on the generous support of individuals and groups who are concerned about living conditions for the people on American Indian reservations. NRC serves about 75 reservations and over 70% of donations go toward programs. Only 2% goes toward administration. By working with us, you join the circle of NRC staff, Program Partners, and Supporters who create a positive impact for over 300,000 Native American people a year… people who are simply grateful that you remember them. TOMS Shoes selected NRC as a Giving Partner because they want to help people domestically as well as internationally. TOMS recognized that American Indian reservations have the highest rates of need in the U.S. and that NRC has the partnerships and distribution system in place to get their shoes to every school in our service area. Through their support, NRC will be able to provide TOMS Shoes to children year after year, until they graduate from high school. General Mills awarded National Relief Charities a “Champion for Healthy Kids” grant, because of our collaborative project with the Crow Creek Head Start. Through this project, we introduce exercise, nutrition, and education during early childhood to help shape good habits and stave off the double threat of obesity and diabetes for Native youth. This culturally-relevant curriculum has the potential to be a model for other reservation Head Starts. Matthew 25: Ministries was the first organization to give in-kind products to National Relief Charities. Their early donations of basic products that were integral to NRC’s services allowed NRC to expand the number of partners and reservations being served. Today, Matthew 25 continues to provide a significant amount of material goods that NRC gets to the right reservations at the right times. Feed the Children includes NRC in their giving because they realize that American Indians are the most underserved group in the United States. They do a good service by passing along quality products, knowing that NRC can get them to the people who most need them. 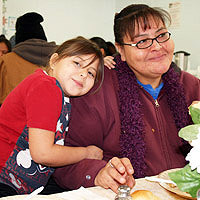 Their support has helped NRC meet a wider variety of needs on the reservations. 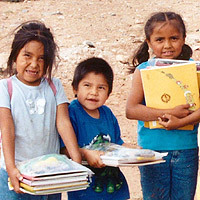 The Windmill Foundation gives to our American Indian Education program. They choose us because of the way we select students for scholarships and because of the way we measure and report on student progress. 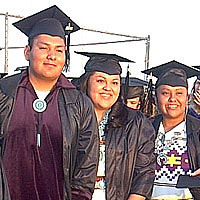 Their significant support has helped us expand our scholarships for Native American students who wish to continue their education in a four-year university after completion of a two-year tribal college. The H.O.M.E. Foundation gives to National Relief Charities out of concern for the elderly population. They support the way that NRC encourages socialization in isolated communities and involvement from the community in the delivery of our services. 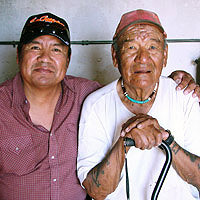 Their support has enabled NRC to execute several community-based projects in behalf of Native American Elders. Deborah Lumsden is an American citizen and a lifetime supporter of our American Indian Education program. She wants other donors to know that she chooses NRC because of our mission, because for our staff the work is more of a calling than a job, and because our approach supports esteem and dignity for the people being served. Deborah is part of the vital circle of individuals who support NRC with funding throughout the year. Charity begins at home, not overseas. American Indians living on reservations are the most underserved group in the United States. The rates of poverty and unemployment among this population are the highest of any ethnic group in the country. NRC is very good at working in Indian country. We have an approach that has been time-tested for nearly 25 years. 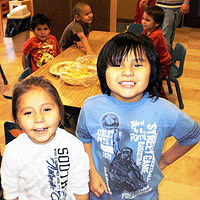 It is respectful and supports the self-determined goals of the reservation programs that we serve. All of our program staff has experience working on the reservations. We maintain a regular presence on the reservations and are familiar to the communities. We often work hand in hand with our partners during events and distributions. NRC works through partnerships with reservation-based programs to understand the needs and provide the right support for each community. More than nine out of ten partners report being able to provide an enhanced service to their community because of working with NRC. When family foundations, community foundations, and corporations give to NRC, it is often because we address urgent needs connected with extreme poverty. Often the family or organization places a higher priority on certain needs, such as hunger, healthcare, youth services, elder services, education, or housing. Sometimes the goals of a foundation match the way we approach the work. Often, groups who support us appreciate that our approach helps reservation communities avoid dependency, while addressing both short-term and long-term solutions. In addition to humanitarian relief efforts, NRC has grass roots projects underway with a focus on sustainability. Examples are developing farmer’s markets, garden tilling and training projects, and housing projects. We are always in need of grants to support projects related to youth, the elderly, or community collaborations. If your foundation or organization is concerned with basic humanitarian relief efforts, or long-term, high-impact projects, we hope you will remember National Relief Charities and the American Indian people we serve. When privately-owned businesses or corporations decide to donate products they make or sell, it is often because they have a strong sense of corporate social responsibility (CSR). They want the products to have a positive impact on the lives of people here in this country, but they lack the partnerships and distribution system to get the products to the people who need them. They often choose NRC because we excel at getting the right products to the reservations. Sometimes businesses give because they have a surplus and a donation helps their bottom line more than a loss. This is not to be frowned upon; it is a simple fact of doing business and giving is giving. These donors give high volumes of new, quality products that are needed on the reservations. Other businesses give products they cannot sell, ship, or store cost-effectively. In the case of food, they may be unable to sell or ship the product prior to expiration. NRC can distribute fresh, canned, packaged, and frozen food immediately to people in need on the reservations. 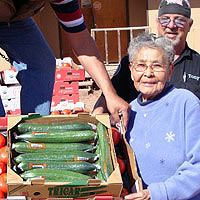 The number of families turning to reservation food banks has risen dramatically. High volumes of food that is fresh, nonperishable, or not expired, are needed and welcomed. 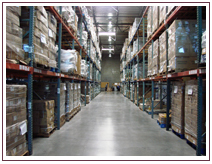 Goods have the highest value when they are the specific goods a Program Partner needs. Because NRC strives to put the right products into the hands of the right partners at the right times, we are equipped to 1) store and transport the goods, and 2) help the partners use the goods to create more good, such as more nutritious meals or higher attendance at health screenings and classes. This means that your in-kind products will have more impact when you donate them to NRC. our reservation partners each year. 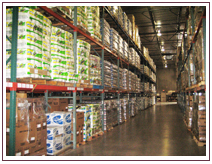 NRC stocks about 700 types of products in our Plains and Southwest distribution centers. These include nonperishable food; school supplies; Christmas toys and gifts for youth; personal hygiene items; emergency items such as blankets and batteries; diapers and baby items; bottled water; toilet paper; coats, hats, and gloves; and more. We use this ready inventory to provide emergency disaster relief to tribes, often as first responders. 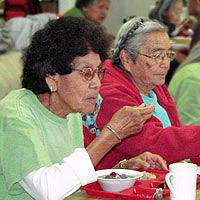 We also maintain partnerships with hundreds of senior nutrition centers, food banks, and soup kitchens, as well as health and wellness centers, schools, churches, and other programs that distribute goods directly to reservation community members. To serve these partners, National Relief Charities is always in need of high-volume, quality products. In addition to grants and products, corporations also encourage philanthropy and support employee giving. National Relief Charities participates in workplace giving programs such as the Combined Federal Campaign (CFC) and the State Employee Campaign (SEC), and we can establish a workplace giving campaign just for your company. Employers that are looking for a charity to adopt or a project that involves their staff in CSR often find an untapped interest related to Native Americans. We also encourage individual employees to exercise their own “corporate social responsibility” by looking into what your employer does to support charitable endeavors. Find out whether your employer has a matching gift program to boost the impact of your personal giving. See if they participate in the CFC or SEC in your state or whether you can organize an employee giving campaign. Ask whether they’re looking for a charity to adopt or projects to sponsor, and whether they give employees time off to volunteer or conduct a drive for something like school supplies. TOMS, for instance, gives shoes for thousands of Native American children each year. If you’re thinking about organizing a drive, NRC can always provide you with insights on high-need products for the reservations. Call our Donor Relations Department toll-free at 800-416-8102 for assistance. NRC is blessed to have the support of half a million donors who care about American Indians and support our ongoing work. Some donors make many small donations repeatedly throughout the year. These add up to help create a significant impact on the reservations. Some donors give monthly, which helps us defray the cost of fundraising. Heritage Circle members bequeath legacy gifts to NRC to ensure that Native needs are met into the future. Other donors give to help cover the cost of transporting goods to the remote reservations we serve. If you think American Indians deserve a quality of life that is similar to other Americans, please consider making NRC your charity of choice. Each of these types of support is needed to cover the ongoing cost of providing humanitarian aid to the reservations we serve. With your support, we can continue our important work and move toward our vision of strong, self-sufficient American Indian communities. For questions about grants or volume giving, please email Programs or call 866-556-2472. For questions about individual giving, please email Donor Relations or call 800-416-8102.